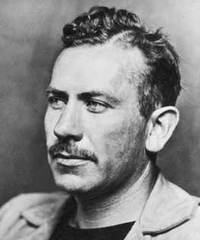 Today in Masonic History John Ernst Steinbeck, Jr. is born in 1902. John Ernst Steinbeck, Jr. was an American writer. Steinbeck was born on February 27th, 1902 in Salinas, California. He spent his summers working on nearby ranches with migrant workers, an experience he would use in some of his later books. While working on the ranches, he would find time to write. He graduated from Salinas High School in 1919. He went on to study English Literature at Stanford University near Palo Alto. He would leave Stanford before attaining a degree in 1925. After Stanford, Steinbeck traveled to New York where he worked odd jobs and continued to write. He eventually would make his way back to California. He would meet his wife while he was working as a tour guide at Lake Tahoe. After a brief stop off for the couple in Las Angles around 1930, the two headed to Monterey, where Steinbeck's parents owned a cottage. The couple lived there rent free, Steinbeck's parents supported him financially so he could focus on his manuscripts. In 1929, Steinbeck would sell his first novel, Cup of Gold. It was a piece of historical fiction about the privateer Henry Morgan. The following year he would meet his friend, Ed Ricketts. Ricketts and Steinbeck would become fast friends and they would remain so until Ricketts passing in 1948 due to a car accident. In the 1930's, Steinbeck, inspired often by Ricketts began to write some of his more famous novels. In 1935 he published Tortilla Flat, a novel set in post World War I Monterey. It followed a group of friends that some critics described as caricatures of the Knights of the Round Table. This period would also mark the beginning of what some call his "California novels" or Dust Bowl fiction. This would include Of Mice and Men and The Grapes of Wrath. Staring in the 1940's both books would be made into movies and stage plays. Both are still being performed today as well as new versions of the movies being made. The Grapes of Wrath was actually a very controversial book at the time. He received a massive backlash at home, the book was banned from local libraries as being obscene and not representing what was happening in the county. In 1942, Steinbeck published The Moon is Down. The story was about a small town in Northern Europe where the people resist the occupiers of their village. It has been presumed that the town was in Norway and that the occupiers were the Nazis, although neither the country or the occupiers are identified in the novel. During World War II, Steinbeck worked as a war correspondent. He would largely follow Douglas Fairbanks Jr. special unit. In the course of covering the unit, Steinbeck saw action and on at least one occasion helped the unit capture Nazi soldiers. Steinbeck returned from the war with shrapnel in his body and what would be called today post traumatic stress disorder or PTSD. In 1945, Steinbeck published Cannery Row. A book that had his friend Ed Ricketts as the main character of "Doc". Cannery Row was well received in his home town, as opposed to The Grapes of Wrath. The backdrop of Cannery Row is Monterey, California and the real street where the novel takes place was renamed Cannery Row in 1958. In 1961, Steinbeck published his final novel The Winter of Our Discontent which examined moral decline in the United States at the time. The book was not a critical success, although most recognized the importance of the novel. In 1962, Steinbeck received the Nobel Prize for his lifetime of work. The award was controversial and many critics in the United States felt that the award should have gone to another writer. Steinbeck passed away on December 20th, 1968 in New York City, New York. He passed away from heart disease and congestive heart failure. Steinbeck was a member of Salinas Lodge No.204 in Salinas, California.